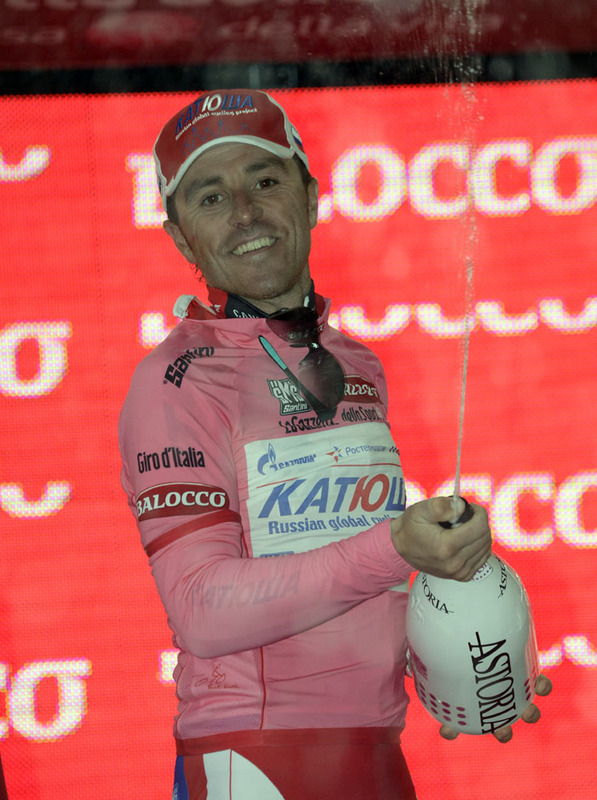 Enrico Battaglin sprinted to a surprise stage victory at the end of the fourth stage of the 2013 Giro d’Italia in Serra San Bruno. The 23-year-old Bardiani Valvole-CSF Inox rider got the better of fellow Italians Fabio Felline (Androni Giocattoli-Venezuela) and Movistar’s Giovanni Visconti on the slight incline into the finish. In heavy rain, the testing final kilometres split the peloton into several groups, with Bradley Wiggins the most notable of those who lost out. The Sky rider conceded 17 seconds after being caught behind a crash involving Christiano Salerno (Cannondale), and slipped from second to sixth overall, behind GC rivals Vincenzo Nibali (Astana) and 2012 Giro winner Ryder Hesjedal (Garmin-Sharp). Luca Paolini finished 10th on the stage to remain the race leader’s pink jersey; just reward for his Katusha team’s efforts throughout the stage. They controlled the peloton throughout, and were only helped out in the closing kilometres by Vini Fantini and Sky. A number of riders attempted to break away on the third-category Vibo Valentina climb with 40km to go, before Danilo Di Luca (Vini Fantini) and Colombian Robinson Chalapud Gomez clipped off the front of the bunch on the second-category Croce Ferrata climb 10.2km from the line. The duo appeared as if they would resist the chasing peloton and hold on to contest for the stage win, but they were caught on the slightly-uphill run-in to Serra San Bruno with 500m remaining. 10. Luca Paolini (Ita) Katusha all at st.
6. Bradley Wiggins (GBr) Sky at st.